For decades, people who have searched for solutions to hair loss or thinning hair had to wade through several options, which often involved bad results or uncomfortable side effects. But thanks to advances in technology, there’s a new method called robotic follicular unit extraction (RFUE). This is a more advanced version of traditional handheld FUE, a hair restoration procedure which removes one hair graft at a time from the back of the head. The robotic version is performed with incredible precision and accuracy, which has an enormous benefit for the patient over the handheld technique of FUE. This makes it easier and quicker to regain a full head of hair. It’s called the ARTAS® Robotic Hair Transplant System, and it’s a state-of-the-art procedure that can provide you with a permanent solution to your hair loss problems. Prior to the development of the ARTAS® System, anyone dealing with hair loss or thinning hair usually turned to solutions such as hairpieces, hair plugs or painful hair transplants. Some took medications that have to be taken for life. Traditional hair transplant surgery caused side effects such as bleeding, itchiness, infection, swelling, and/or inflammation, according to the website Talking About Men’s Health. These procedures can be painful and involve long recovery times. They also require more follow-up visits before patients noticeably show a full head of hair. Before the ARTAS® system was developed, doctors had to do everything by hand. With the ARTAS® Procedure, a patient can achieve more consistently natural results. A patient can have the procedure in the office after meeting with the doctor for a free consultation. 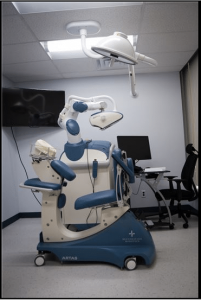 At that meeting, multiple photographs of a patient’s head and scalp will be taken and ARTAS® technology may be used to map out the whole procedure. While other doctors use treatments which involve removing a large strip of the scalp, the ARTAS® Procedure harvests the healthiest individual hair follicles one at a time directly from donor area in the back of the head in a virtually scarless manner with minimal discomfort. The ARTAS® system employs FDA cleared, robotic technology to assist physicians in the hair transplant process. The robotic system will help your doctor and be more precise than the human hand. Each hair is individually targeted. According to Restoration Robotics, the manufacturer of the robot, the system tracks all of this in real time, updating information 60 times per second. The robotic arm is controlled by the doctor, who will transplant the hair into the necessary areas of the patient’s scalp. The precision employed by the ARTAS® system also gives the patient’s head a more natural look when the procedure is finished. It won’t leave a noticeable scar such as what can be seen after strip surgery. The reproducible precision and accuracy greatly diminish the chance of errors occurring. This results in the highest quality hair transplant procedure possible, performed in a virtually painless manner, leading to a quicker recovery. Most patients are able to sleep comfortably the same night of their procedure without the need for narcotics and are able to resume a normal life in days rather than weeks as is the case with other hair transplant techniques. If a patient is interested in experiencing the most comfortable hair transplant procedure using the most advanced technology in hair restoration available, the place to go is Robotic Hair Restoration of Long Island. The office environment is warm and inviting. The consultation will be with friendly team members in a very comfortable setting without any pressure at all. The conversation will be lively, all questions will be addressed, and all concerns will be put to rest. Dr. Gohil, who is a board-certified surgeon, has more than 10 years of surgical experience and meets all hair loss patients individually. He will be with every patient through their entire journey. The team of hair loss specialists will educate each patient individually and design a customized, bespoke treatment plan for every surgical candidate. Call today at (516) 605-1545 or fill out the contact form to schedule a free consultation.